A mobster's wife turned supergrass to help snare members of an Italian gypsy mafia clan who stuffed their homes with gold-painted statues paid for by the cocaine trade, it has emerged. 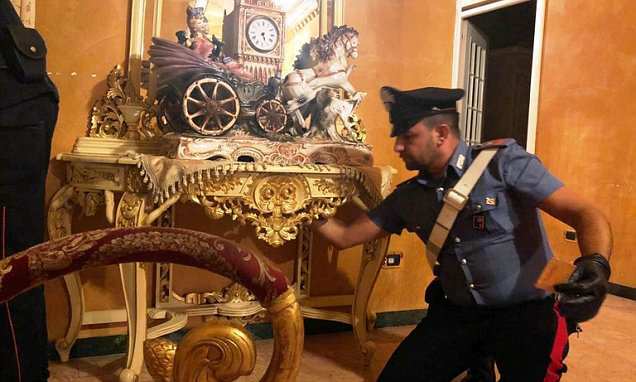 Italy's military police launched a huge operation involving some 250 officers as they swooped on luxury villas belonging to Casamonica members on the outskirts of the capital, Rome. It has since emerged that Debora Camorra, the 34-year-old wife of one of the senior mobsters, Massimiliano Casamonica, gave vital information to police. According to The Times, police had bugged the clan during surveillance but had difficulty understanding the Romany dialect they used. She is said to have decided to help police after being held a 'virtual' captive by feared clan member Liliana Casamonica, whose influence had grown after her top brother - himself a top mobster - was in prison. Ms Cerreoni, whose husband is the brother of clan chieftain Giuseppe Casamonica, is said to have revealed that the family threatened to 'dissolve her in acid' as they questioned her loyalty to the clan. She is now in police protection. Authorities picked up mobsters who have worked for the notorious clan on charges relating to drug trafficking, extortion and loan sharking. The raids took place in parts of Rome, as well as Reggio Calabria and Cosenza further south in Italy.